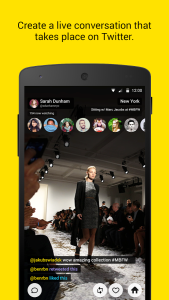 Meet the pioneers of Live Video Streaming, yes we are talking about the “Meerkat” android app. For all those who wanted to know what exactly Meerkat does is that it enables you to broadcast the Live video to everyone on internet with the help of your twitter account. Meerkat is first of a kind of video streaming app which debuted in Southwest, Texas in 2015. This one is way better than the likes of Livestream. This service was earlier available in a closed environment which accepted only beta testers in a closed programs and now it’s all available for everyone in Google Play Store. 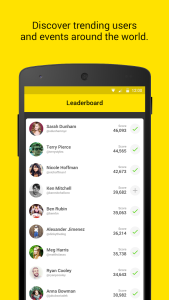 Download Meerkat app from Google Play Store and link your twitter account after which it will publish a tweet from your profile to public to alert that you are broadcasting something live to the World. Accordingly, Meerkat also allows you to view the other streams as well. This one also gives you the instant feedback from users as well through the likes and comments on Live video. Broadcasters can also measure the stream likes and other metrics to calculate the success of the stream. 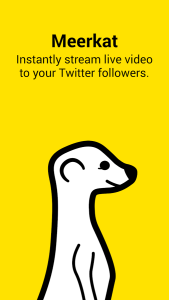 The only disadvantage of Meerkat as of now is that it doesn’t allow users to save / download the stream which may be available to the paid users going down the line. While this app is available for download in public, this app still comes with the beta tag. Do try this one out and let us know on whether you liked it or not. There is a similar service which twitter has launched recently which is dubbed as #Periscope which we will be checking out very soon. In Meerkat, twitter has strategically denied access to whole friends circle which Periscope enjoys as it’s officially of twitter. We will very soon check out in detail about Periscope as well which has better interaction capabilities when compared with Meerkat.